The songs and artists for this year's Söngvakeppnin in Iceland have just been announced by Icelandic broadcaster RÚV. All the songs have to be performed in Icelandic language in the semi-finals. In the final it's optional for each singer if he/she will perform the song in Icelandic or in English. 4 Þórdís Imsland Nú og hér What Are You Waiting For? 2 Friðrik Ómar Hvað ef ég get ekki elskað? What If I Can´t Have Love? "Hvað ef ég get ekki elskað?" "What If I Can´t Have Love?" Friðrik Ómar participated in Eurovision 2008 as part of Euroband with the song This Is My Life (14th), and was also backing singer for Iceland in 2009. Hera Björk represented Iceland at Eurovision 2010 with Je Ne Sais Quoi (19th), and was also backing singer for Iceland in 2008, 2009 and 2015. Söngvakeppnin 2019 consists of two semi-finals and one final. The semi-finals will be held in Háskólabíó and the final in Laugardalshöll. 10 songs have been picked to compete in Söngvakeppnin 2019 – Five songs for each Semi-final. Two songs from each Semi-final will qualify to the Final, decided by a combination of public votes and an expert judging panel. RÚV has the option to award a wildcard to a fifth finalist. 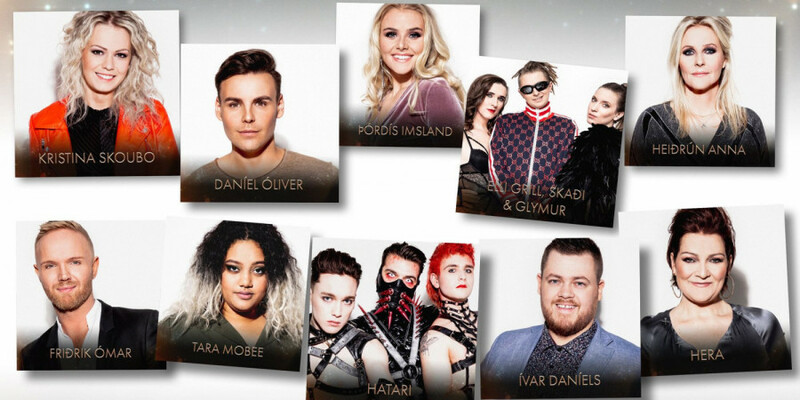 In the Final of Söngvakeppnin 2019 a ten-person, international panel of expert judges will give their opinions and their points, alongside the public vote and select two songs for the Super Final. The two super finalists will keep their points from the first voting and will perform their songs again. A second round of voting will decide the winner. All three shows will be broadcast live on RÚV. Iceland 2009: Yohanna - "Is It True?" Iceland's debut in Eurovision Song Contest was back in 1986, and has been participating 31 times since. Best result are two second-places with Yohanna in 2009 and Selma in 1999. Since the introduction of Semi-finals in 2004 Iceland qualified to the Grand Final 8 out of 15 times – the last four years the Grand Finals were without Iceland. Iceland is the only Northern European country that has yet to win the Eurovision Song Contest.